The very characteristics that make social media incredibly appealing to consumers are the same ones that make it ripe for scammers seeking to exploit the value and power of established brands. It's not unusual for fans and consumers to be exposed to something new every day, whether a promotion, contest, fan page or enticing content. And, without much history to signal what is genuine and what is not, consumers find themselves at risk of being hoodwinked by brand impersonators, malicious account spoofers and counterfeiters. 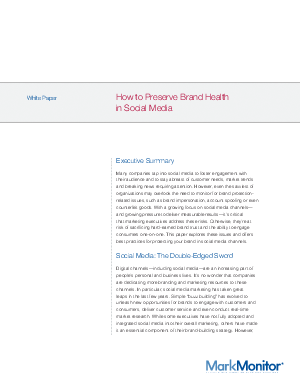 This white paper offers best practices for protecting your brand - and brand engagement - in social media channels. MarkMonitor® is the world leader in enterprise brand protection and a Thomson Reuters Intellectual Property & Science business.